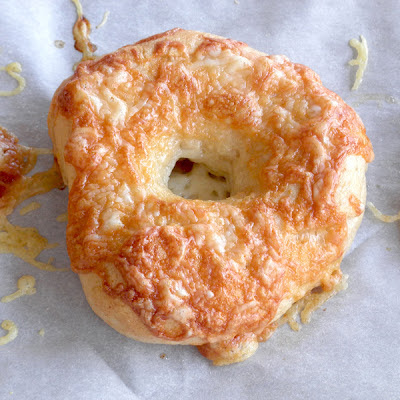 These have the perfect bagel texture. Without going into too much detail and specifics about my son's "condition," I'm trying to limit my older son's gluten intake again. One of his very favorite (and disastrous) gluten-y eats is the asiago cheese bagels they have at church every Sunday morning. For the past month or so, I've had to deny my poor kid the joy of eating his half bagel on Sunday morning, because it just made him too weird come Monday at school. Now that I've found Better Batter Gluten Free flour, I feel like experimenting more, and I was very excited to try a gluten free bagel. 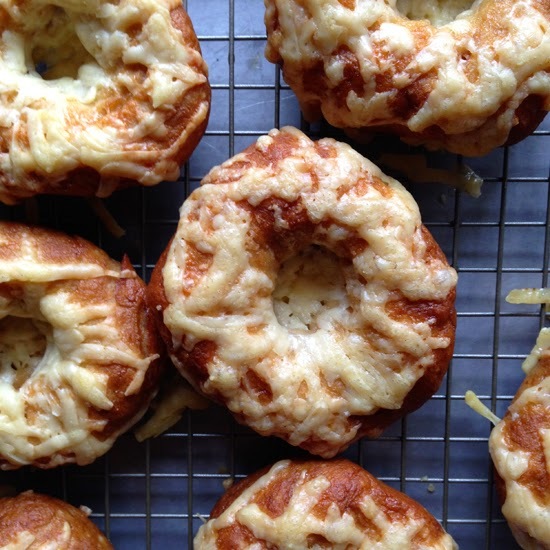 My gluten-limited son says these bagels are "weird, but good." "What do you mean by 'weird'?" "Um...uh. It tastes kinda funny, and chewy and fluffy, but good. In a cheesy bread kind of way." We'll see if he finishes the others I placed in the freezer. The flavor here definitely isn't that of a wheat bagel, but my son, who knows asiago bagels, doesn't mind. 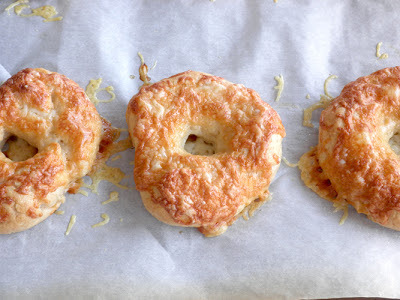 I actually slice these for him, butter the cut faces, sprinkle with garlic salt, and broil in the oven, sort of like the Toasty Parmesan Garlic Bagels I love so much. The first time I made these, I made 8 bagels from the recipe, but I think that made them too big and dense, and they didn't bake thoroughly. 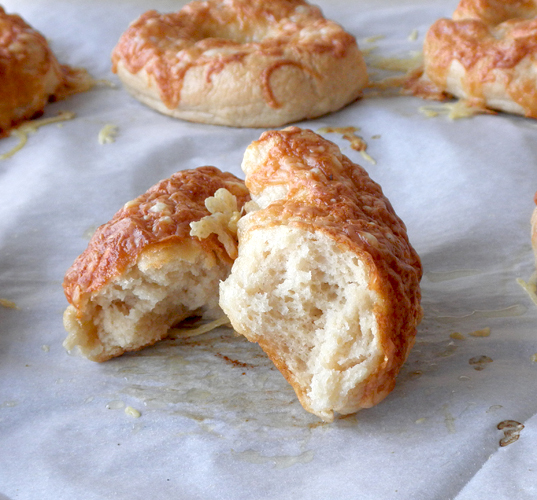 So the next time, I divided the dough into twelfths, and they turned out perfectly, as you can see in the pics. P.S. The second batch of these bagels have REALLy gone over well with my gluten-limited son. He's already breezed through this batch in less than a week, so I will be making them again this weekend. Ahhh...it does my mom's heart good to know my son has a replacement for his beloved Sunday morning cheese bagels, AND he can enjoy them any day of the week! Mix all dry ingredients in the bowl of a stand mixer fitted with the paddle attchment. Add the water and molasses mix on low until the mixture resembles very sticky play-doh. Lightly flour a flat work surface (it should barely be covered with a fine film of flour). Divide the dough into 12 equal pieces. Gently roll the dough balls on the floured work surface until they’re smooth. Flatten each ball ito a disk, about 3 inches by 1 1/2 inches thick. Very gently, with floured hands, poke a hole into the center of the dough an work it until the hole is about 1 1/2 inches in diameter. Repeat with all the dough. 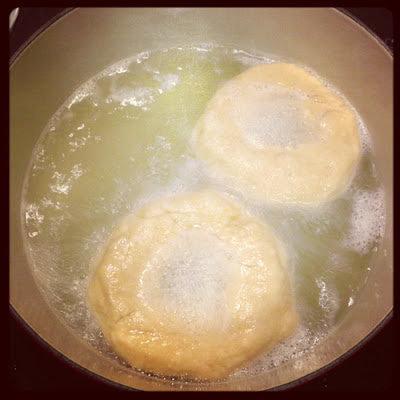 Let the bagels rise for 40-50 minutes, or until puffed (they won't double in size). Heat a pan full of water, at least 3 inches deep to boiling. Add about a tablespoon of sugar per 2 quarts of water. Drop two or three bagels in at a time. They swell quite a bit as they boil, so don't crowd them. Boil for 2 minutes, turn over, and boil for another 1-2 minutes. Remove with a slotted spoon and drain a little on a paper towel. 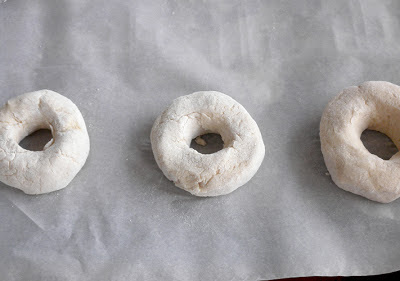 Place back on parchment paper. When one sheet of bagels has been boiled, carefully place about 2 tablespoons of cheese around each bagel. If some falls into the center, that's fine. It makes a nice cheesy center. Place in the oven and bake for 30-40 minutes, or until well browned and puffed. Remove from oven and transfer to a wire rack to cool. Let cool completely before slicing. *I say use a "good quality" asiago cheese because the ones you see pictured here were made with Target's Archer Farms brand asiago cheese. I tried Target's Market Pantry brand last time (which was also pre-shredded, as opposed to the Archer Farms chunk), and the Market Pantry asiago cheese turned a deep mahogany color. Still edible, but not as delicious as the previous ones. but they do look nice, in my opinion. THANK YOU!!! I love the recipe, I'm going to try it soon. And an extra thank you for the link for better batter products. I've been looking for a cup for cup gluten free ap flour for a while now, so I'm just waiting for my flour to be delivered!! So excited!! I just finished making these and I think something went terribly wrong. They were awful! I checked and re-checked the recipe in hopes that I did something wrong, but I followed it to a T.
Was the taste bad, or did they not rise? If they did not rise, the water may have been too hot and killed the yeast. If they tasted bad, maybe you need to try a different brand of asiago cheese. :/ I'm sorry it didn't turn out. I know how frustrating and disappointing that can be. Let me know what went wrong exactly and I'll try to trouble shoot.